The Volkswagen Passat is an extremely important model for the German brand. In fact, over the years they’ve built more Passats than the legendary Beetle. It’s now time for the eighth-generation Passat, due to be unveiled to the public at the Paris motor show in October this year. It will be slightly shorter and lower than the outgoing model, yet more spacious for occupants and luggage. The passenger compartment is 33mm longer than before and there’s an extra 26mm of headroom, despite a slight reduction in the car’s overall height. Volkswagen’s engineers have also managed to trim the Passat’s overall weight by an impressive amount – as much as 85kg, depending on derivative. That weight loss, together with the smaller dimensions’ positive effect on aerodynamics and various engine improvements, has led to improved fuel efficiency and CO2 emissions. Fuel consumption has been reduced by as much as 20 percent, Volkswagen claims (depending on exact model and spec), and CO2 emissions by a greater amount still – something that will no doubt grab company car fleet managers’ attention. We’re still waiting to hear which engines will be available for the UK market but likely to be included in an extensive petrol and diesel range are VW’s latest active cylinder units, which can shut down half of the engines cylinders when not under high load (trundling around town for instance) to save fuel. There will also be a plug-in hybrid model, capable of a 50km range on electric power alone and a total range of 1,000km. Performance-hungry drivers may also be interested in the new four-cylinder BiTurbo diesel engine, likely to be something of a wolf in sheep’s clothing. With 237bhp and a colossal 500Nm of torque, it will be available only with four-wheel drive and a seven-speed DSG automatic transmission. A roster of clever new technology includes the latest generation of automatic emergency braking (AEB) with pedestrian recognition and a new Emergency Assist function, which can bring the car to a controlled stop autonomously if it detects that the driver has collapsed at the wheel, for instance. There’s also a neat party trick in the form of Trailer Assist, an extension of the already existing automatic parking system – the Passat can now not only steer itself into a parking space but also do so while hitched up to a trailer. VW also reckons the new Passat will park itself better than most humans can. Three types of headlights will be available: halogen lamps, all-LED headlamps (replacing the outgoing Passat’s xenon units) and a further, more sophisticated LED setup. The top LED option will include a cornering function, where the lamps swivel to the inside of the road automatically, as well as an integrated camera which can continuously alter the path and intensity of the beam very precisely to avoid dazzling traffic ahead. Full LED tail-lights are standard, and can include a function whereby a different pattern is displayed if the driver brakes hard, to help alert traffic behind. Details of the interior are still to be confirmed, but the instrument panel will include a widescreen digital display between the rev counter and speedometer a little like that of the upcoming new Audi TT, with selectable displays including both 2D and 3D sat-nav. Following it’s unveiling at Paris, the new Passat will be released in Europe towards the end of 2014 and will reach UK showrooms early in 2015. 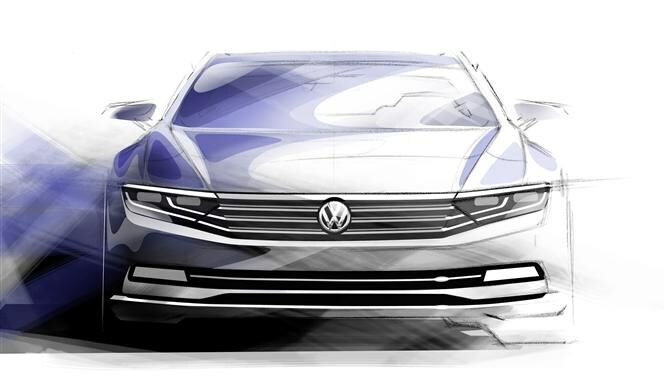 VW has yet to unveil official pictures of the new Passat but it has released sketches of the poposed new car (see above). We’ll be getting behind the wheel of this important new car in Autumn this year – check back for the full 2015 Volkswagen Passat review.